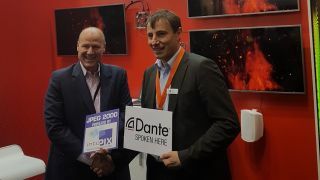 The What: Audinate announced that it will integrate intoPIX’s pro AV optimized low-latency JPEG 2000 technology into its new Dante AV Design Suite for use with the newly announced Dante AV Module. The What Else: The incorporation of intoPIX’s technology will enable the system to deliver a visually lossless 4K60 4:4:4 HDR video experience within a standard 1-gigabit Ethernet network. “Unlike normal JPEG 2000 solutions, our codec reduces latency down to 10 milliseconds and is more suitable for pro AV content—two features crucial to the industry,” said Gael Rouvroy, intoPIX CEO and director of technology. The Bottom Line: intoPIX’s JPEG 2000 will enable Dante AV to create 4K multi-screen environments, allowing audio to be routed wherever desired; deliver tight lip-sync during live presentations with video thanks to low latency; deploy and manage video walls at lower cost thanks to the utilization of Cat-5e cables and switchers; and simplify installation and use of conference rooms that combine video and audio media. The Dante AV Module will be unveiled at Integrated Systems Europe (ISE) 2019 in Amsterdam, Netherlands on 5-8 February, Hall 7, Stand C230. intoPIX will demonstrate their JPEG 2000 ULL next to other technologies for AV-over-IP on their stand 10 N-199.